Lest anyone think, this blog only covers YA & Kid Lit, let’s chat about one of my favorite Youtube shows, My Drunk Kitchen. Haven’t experienced Hannah Hart’s charming drunk cooking show? Check it out here. (Fair warning, there’s cursing.) I’ll watch another episode while I wait. One day, Hart got drunk & recorded herself making grilled cheese. My Drunk Kitchen was born, and now viewers are treated to Hart drinking & cooking every Thursday. Her videos are full of puns, inventive cooking, and even a bit of life wisdom. And her newly-published cookbook “My Drunk Kitchen: A Guide to Eating, Drinking, and Going with Your Gut,” is the same in a lovely, well-photographed, written form. It’s hard to classify this book. There are recipes, but they’re not super exact – more like suggestions, really. There’s life advice, but it’s not a lifestyle or self-help book. Basically, it’s a book for fans of the show, or people who think they might be, but don’t have a good enough internet connection to watch Youtube videos regularly. It’s full of life gems like “Don’t do things to prove others wrong. Do things to prove yourself right,” and cooking truths like “A French fry is a perfect starchy slice of love and joy, dancing delicately from the plate before you to its permanent home in your mouth cave and then finally to the resting place of your tum-tum.” Plus: puns! Some highlights: the Hartwich, Things in a Blanket, and Pizzadilla. I’ll leave it to you to decide what it says about me that these are things I would really like to cook. Verdict: Affirmed for fans of the show, or people who would like to be. It’s a fun book to check out, and you might be inspired to get creative in your own kitchen! If you’re turned off by the show, this book isn’t for you. 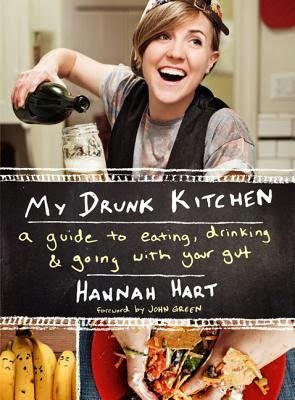 "My Drunk Kitchen: A Guide to Eating, Drinking, & Going with Your Gut" by Hannah Hart, published by It Books on August 12, 2014.